The picture shows a Jensen MOD 6-15 speaker in a 50 Litre enclosure. 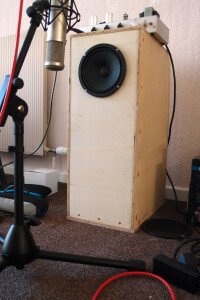 It’s a big box – around two feet tall – but, because the speaker is designed to work in an open-backed cabinet, it’s smaller than it needs to be for maximum bass response (as calculated using the Thiele/Small parameters provided by Jensen). However, the bass roll-off is not dramatic and the bass response is restored by pushing the cabinet up against a wall (that’s the proximity effect at work). So how does it sound? It’s killer – a joy to play through. There is no lumpiness or bass emphasis as there is with an open-backed cabinet (because of the inherent comb filter). In fact, on paper, the frequency response of this speaker is very similar to the coveted P10R Alnico speaker – a fact that was confirmed by my tests – but it costs a fraction of the price. The only downside is that the MOD 6-15 speaker is 5dB less efficient than its Alnico sibling but that’s not really a drawback when you’re playing at home; 1W has power to spare. This definitely the way to go for those who want a good sounding setup for home use at spouse- or parent-friendly volumes. I know this sounds unlikely – after all it’s using a cheap and cheesy 6 inch speaker like that in a Champion 600 – but the large cabinet allows the speaker to work to the best of its ability. The rule here is that it’s better to have a cheap speaker in the right cabinet than an expensive speaker in the wrong one.